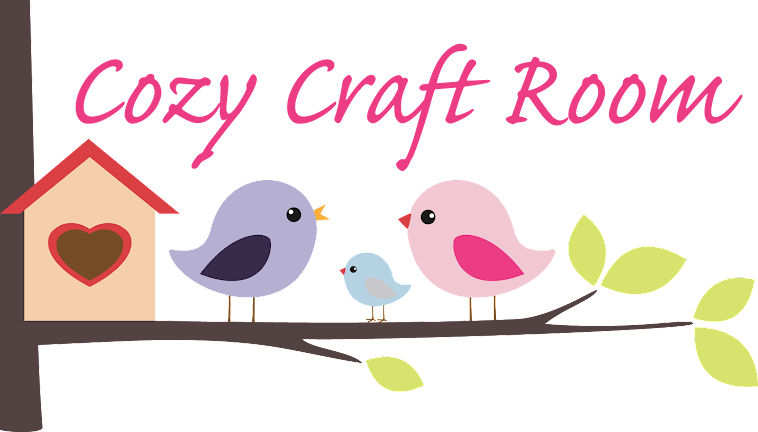 Cozy Craft Room: Heart Projects Step by Step!! Hi, I am back today with a step by step on the notebook in the last post. I had gotten the January Creativity Magazine and there was a free gift with it, Stamp set and paper pack. I used one of the papers a small floral, it was A4 size so I cut it in half and tore the edges. I stuck it down on the front and back covers using Claudine Hellmuth Studio Multi Medium in Matte. I left it to dry and cut some Jute ribbon and sprayed it with Glimmer mist Iridescent Gold. It's hard to see in the photo but it gave it a nice shimmer. I used the Multi Medium to stick this down to the left side of the book. Next I got a small Doily and sprayed it with the same glimmer mist. I dried it with My Heat Tool and stuck it down with the Multi Medium. Next I took another one of the free papers from the pack it had a lovely pattern of tape measures. I stamped the Freebie heart stamp onto the paper with Black Archival ink and cut it out, and again stuck it down with the Multi Medium. I cut the letters from Grungepaper using the Tim Holtz Wordplay die. I covered them with Black Acrylic Paint Dabber, when that was dry I again covered them with Distress Crackle Paint in Clear Rock Candy. I left this to dry overnight as I feel it gives a better effect when left to dry naturally. I again stuck these down with the Multi Medium, where the letters overlapped the jute I needed to add a bit of Glossy Accents to keep it down. Next up I stuck on 2 buttons using the Glossy Accents. I had this Forever Friend 3D Embellishment pack for ages and thought it was too cute to use! Still can't believe I did!! I stuck it down on 3d foam along with a few heart shape gems! My second project is a small canvas. I covered it all over again with a generous layer of Crackle Medium. I left this to dry overnight and then went over it with a coat of white Acrylic paint. This gave the lovely crackle background. I sprayed it with Glimmer Mist Iridescent Gold and Perfect Pearls Mist in Perfect Pearl. I used a Spellbinders Scalloped Heart Die to cut out the Photo and inked around the edge. It was stuck down with Glossy Accents. centre of the lace. I stuck three little roses in the corners. and added two flat back pearls for the finishing touch. "Remember Life's Treasures are People not Things"
Well I hope You enjoyed seeing My projects. Why not come over and join in the fun!! Hope to be back tomorrow.